The Tusk Oil Change Kit comes with the basic items needed to change the oil in your motorcycle, ATV, or UTV. Each kit comes with enough bottles of motor oil (and in some cases transmission oil) to get the job done. The kit also includes a Tusk oil filter, and crush washer for your drain bolt. Each kit is specific to the vehicle you order it for to ensure you get enough volume of oil, the correct weight of oil, the correct Tusk oil filter, and the correct crush washer for your drain bolt. This kit takes the guess work out of ordering the essential items needed for your next oil change. Kit includes enough bottles of oil, correct oil filter, and drain bolt crush washer for one oil change. Great kit. You have the ability to choose which type of oil you want with your purchase. Very convenient to just order the kit. Good value. RMATVMC takes all of the guess work out of changing your oil with this kit. Very convenient and fairly priced. Every thing in one kit, great value for what you get! Nice oil change kit for the price. Would have gave it 5 stars if it came with all of the O-rings for the oil filter cover. If your existing oil filter cover O-rings are in poor shape you will need to buy them separately. Great kit. Easiest way to change the oil. Ships with all gaskets too. I always order an extra one of these kits no matter what I am on RMATV shopping for. 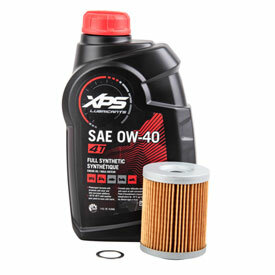 Filters are OEM quality and so is oil, with a selection of oils and filters. Does NOT come with (kawi klr650) oil-filter housing gasket. You can never have too many oil changes worth of materials on hand! Great price and everything you need to change out the oil with the Manufactures recommended oil. Both filters are also included. Overall good kit for my Honda CRF 250X. The crush washers were on the smaller side from the OEM washers. Also the Honda trans oil supplied was 80w compared to 10W40 called out in manual. It took me some time researching to find out that the 80W gear oil supplied was the same as 10w40 engine oil that was called out. This is a well priced oil change kit and comes with the factory recommended oil for my Husky. Great value for actual Honda fluids. Fast delivery and accurate. We buy these kits for everything in our inventory and keep them in the shop, small investment to extend the life of the unit. Spec oils for my 450. No complaints with the Tusk filter so far. I should order more than one at a time. I would definitely recommend this kit to anyone. Makes it so easy to get everything you need for a service. Plus your choice of great lubricants. It is nice to get all the stuff you need in a kit. However my 2012rzr900xp only holds about 2.5 qts, so I had to empty some out. I had watched a video on Youtube since this was new to me. The instructional video said mine would hold 3.5 qts, so I would suggest to any new comers, just put in two qts and check. Overall it looks like I will like doing changes with this kit. Bought the Yamalube Semi-Synthetic kit for my 2011 Raptor 700R. Pros: It came with (2) whole quarts of oil, new oil filter (Tusk), oil filter cap o-ring (genuine Yamaha part) & new crush washer (Tusk). Cons: The Tusk crush washer doesn't fit crankcase plug (inside diameter too small) & no crush washer included for the oil tank drain. Overall, not a total deal breaker for this kit, but I will locally source my next oil change parts to ensure that they are correct for my quad. Was genuine honda gn4 oil like specified came with proper tusk filter and crush washer. Easy oil change kit. I was always forgetting to order the crush washers and just reusing my old ones. Now new every time. Love how it comes as a kit! easy to use and runs great in my bike! Excellent quality and value for the price. Perfect oil change kit for my RZR. Everything you need and contains quality products. Nice to get the crush washer included. oil is same price as local ktm dealer, filter is essentially a few dollars less. If this saves you money, and a trip, it's a five start product! Combine with other product for free shipping, and it's a no brainer. Everything you need for an oil change. Simple, easy and much cheaper than dealer store. Product delivered in a timely manner and had everything you needed. I love this kit, it has everything you need to do a complete oil and filter change, except the labor. Even with shipping cost, this kit saved me more than $5.00 over Kawasaki dealership price. Takes some of the guess work out of the equation of doing an oil change service. Very simple. Nice to have it all in one. Enough oil for a full change and a little extra. I like that it comes with a new crush washer, however the polaris one comes with the exact amount of oil needed and this one come with three quarts so you have to measure. But on the upside you get an extra almost half quart for top offs in between oil changes. I change my oil almost every other time we go ride. My local trusted OEM rep suggested using the OEM Polaris PS-4 oil. This kit not only comes with the PS-4 oil and a Tusk replacement oil filter but also a crush washer. Not an expensive part but on often forgotten one. To me that makes this oil change kit that little extra value. I know I don’t have to run and find a crush washer while in the middle of an oil change. Kit comes with everything you need in one easy order with multiple oil brands to choose from. Will definitely buy again!! Came to me just like how u guys show it and exactly what I needed ! Great oil change kit. Bought it for my '99 KLR 650 and runs like butter! I love Tusk products, high quality and affordable! I love Tusk products, high quality and affordable! I would recommend Tusk products! Great value, and it comes with great choices for the oil provided! Just what you need to get the oil changed. Thanks for putting together a perfect kit. Does what it supposed to do. Great to know everything you need it available in one kit. Bought this for my 2016 Grizzly. Everything is fine. Might need to add a hair more oil than supplied. It's everything you need, to do the job. This is a must have, for anyone choosing to do the maintenance on their RMZ. Not sure if it complies with factory warranty, because of the filter, but in all actuality the tusk oil filter is quality. BEST ANSWER: it will be what ever the manu calls for weather thats semi synthetic or a synthetic blend, it will also come with a oil filter and replacement crush washer. I just need the washer do you offer just the washer? BEST ANSWER: Look in the OEM parts section. If its not there you can buy crush washer kits with multiple types and sizes. Check the contents before you buy for your washer size. Hope this helps. You can either look up the bike the OEM schematics or you if you know what size washer it is you can type in our website "tusk crush washer" and select a washer from there. You can get a crush washer at your local auto parts store. Just take your plug with you and they'll have what you need. I believe they do. But if not you can find them at most auto parts stores also or your dealership. Yes. You can look it up by machine. Synthetic over standard 10/40 ? BEST ANSWER: All a matter of when you want to change oil. If you like to change it more often than conventional. Longer oil changes then synth. Also synth doesnt break down as much with higher heat. But go off of manufacturer specs. So if it calks for synth then use that. If it calls for conventional then you can use either or. Synthetic is always a good choice because as stated it doesnt break down as fast as conventional but however the molecules of synthetic oil are smaller than conventional oil so you have a higher possibilities for leaks. I always run synthetic in high-revving 4-strokes. Regular air/oil cooled machines I just run regular oil! Synthetic provides better longer protection. Is this kit good for a suzuki ltr450? My bike is a 450 Honda, the kit had all that was needed which made it very easy not having to search out each individual item. Type in the make,Model and year of your bike and it will let you know if it will work. I have a 2015 yz450f for the oil change do you use both oil and filter ? BEST ANSWER: Yes you use the oil filter and then how ever much oil the owners manual calls for. Yes I change oil and filter every oil change. Unless you have a serviceable oil filter. What oil comes wit this kit? BEST ANSWER: It will depend on the machine you have. If you could give me your machine specs I would be more than happy to let you know. It comes with two quarts of BelRay 10w-50 Synthetic Ester motor oil. Is the Tusk 4-Stroke Oil Change Kit good for the 2017 Commander Max 1000 XT? First time changing it myself. Is this tusk oil or kawasaki?? BEST ANSWER: You'll have an option in between Bel-Ray, Maxima, or Kawasaki oil. Once you enter in your machine click on size and it will give you the oil options. Has anyone used this on a 2011 Yamaha Grizzly 550 4x4? Is the oil filter a paper cartridge or a metal screw on type? BEST ANSWER: The filter would be a tusk oil filter that matched the stock Oil Filter on your machine. It will come with part number 1154930018 it will be a paper filter that is inside the metal assembly. Will this kit work for my 2008 Polaris Sportsman x2 800 EFI? do you sell the oil kit for the verses 300? Can I use this for my 2004 Z400.? BEST ANSWER: Yes, you will just need to enter in your machine in the drop down boxes above the product image. Then in the size box you will need to select what brand oil you would prefer. Will this kit fit An 2014 honda trx500FA rubicon automatic? BEST ANSWER: Yes this will fit. just be sure to select that machine before adding it to your cart. Thank you for your question. Would you put synthetic oil instead off standard 10/40? BEST ANSWER: I would refer to your service manual on what the make suggest should be used in your machine. I need oil that wet clutch approve is this? BEST ANSWER: this will work to wet the clutch plates. Do you sell JUST the oil filter for a 2017 Can-Am Maverick X3? BEST ANSWER: We sale the OEM filter part # 172110000390. 2013 crf450x My owners manual says sae 10w-30 or 10w-40 for transmission but in the kit for my bike it says 80w/85w in the description? BEST ANSWER: You can use the Pro Honda Transmission oil in that bike and it will be just fine. I've been doing it for years. Oil filter fits k in trx450er?